Here’s an exciting update for all the fans of Young Tiger NTR. After several months long pre-production, the makers of Janatha Garage have finally kickstarted the formal work with music composing sessions today. 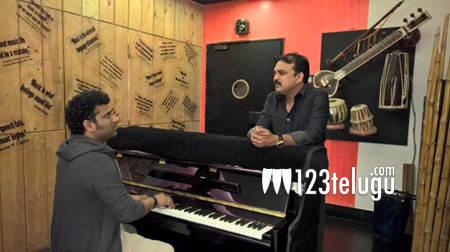 Devi Sri Prasad and Koratala Siva took part in the composing sessions. DSP, who earlier teamed up with Koratala Siva for Mirchi and Srimanthudu, tweeted his excitement saying, “Excited 2 start composing once again with dear @sivakoratala for @tarak9999 #JANATHA GARAGE !! Rocking Script yo”. Both DSP and Koratala Siva are fresh from the blockbuster successes of their respective films, Nannaku Prematho and Srimanthudu. The film’s regular shooting will commence from February 25th. Samantha and Nitya Menen will be seen romancing NTR in this high budget entertainer.